Hubby and I have this “no money gift” policy right now…Maybe after a new roof, a water heater blow up, new fences, asbestos abatement…The “no money gift” policy starts to make sense. I don’t know if this happens after marriage or buying a house, but apparently we’re not the only couple who adopt this policy. However that does not mean we don’t give each other sweet and thoughtful gifts, or lack in romantic gestures. 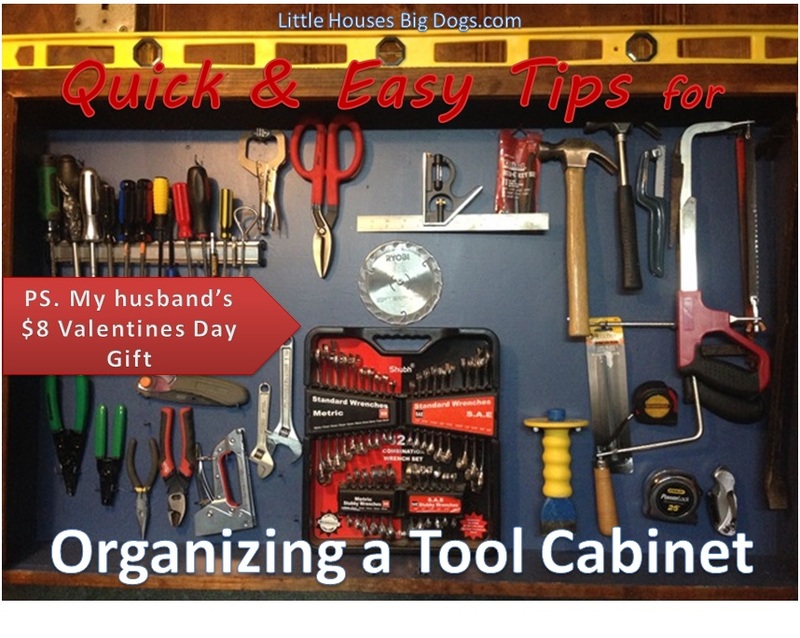 Hub’s birthday, Christmas and Valentines gift request was ALL organized storage and cabinets. (Every one of them in the entire house!) 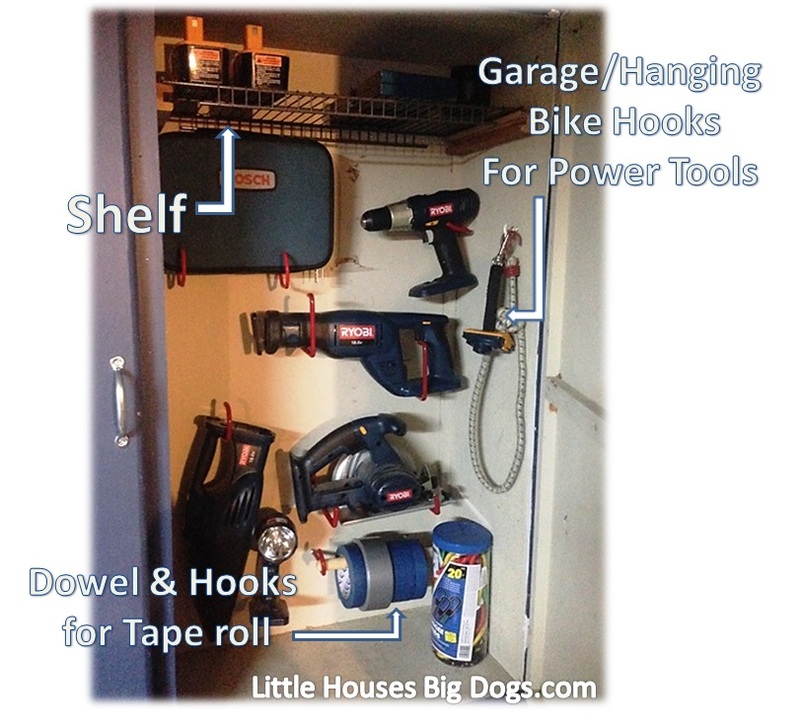 He and I are both “closet” organization nerds (we love the idea of organization, but not always the doing). His official slogan is “no stuff”, but after two homes, even he realized stuff can accumulate. 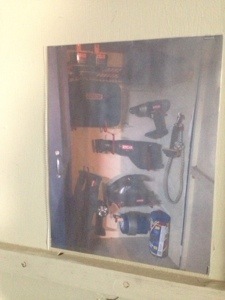 Hence the inspiration for my next project; including before & after shots, and tool organization tips! 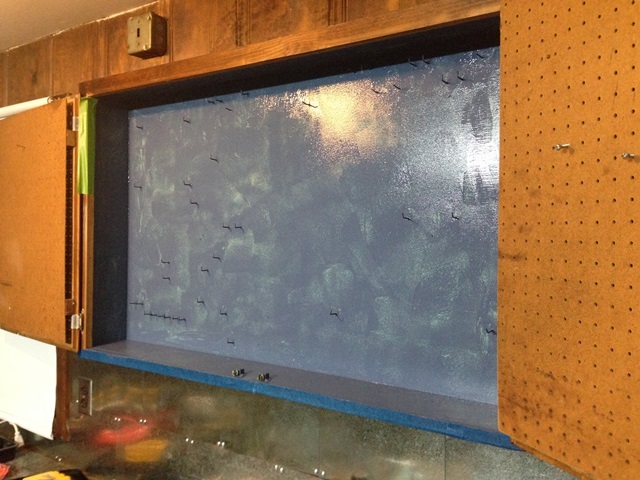 So with Super Bowl and Valentines day approaching I needed to quickly fix this mess…First paint over the really awful original paint with left over cabinet/workbench paint (custom match Glidden denim blue). 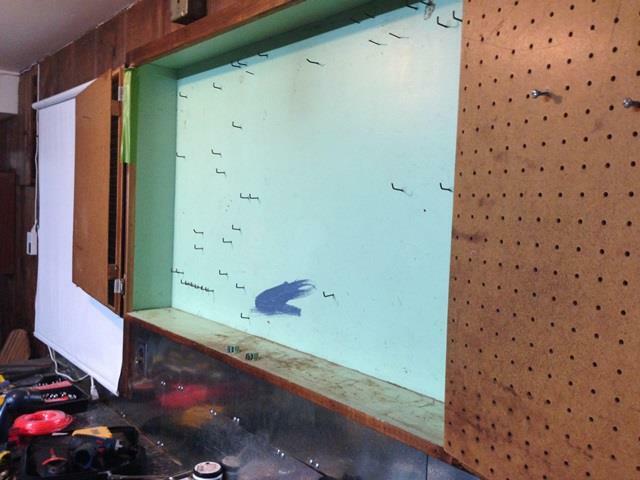 TIP #1 – Take advantage of Magnets! 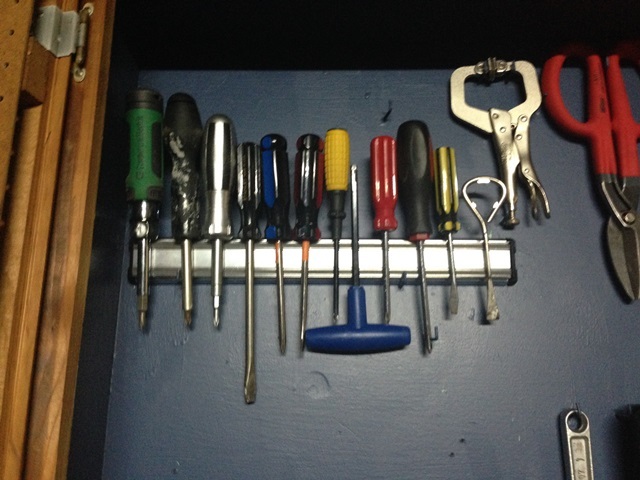 We already had an Ikea magnetic strip, normally used for knives. 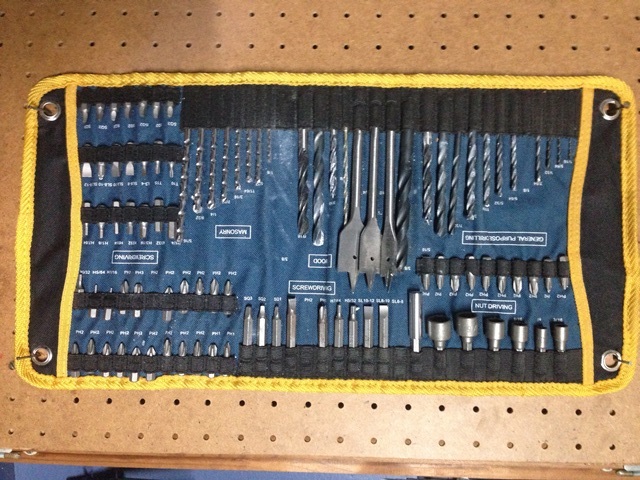 This became a great idea for storing our eclectic mix of screw drivers and tool randomness. 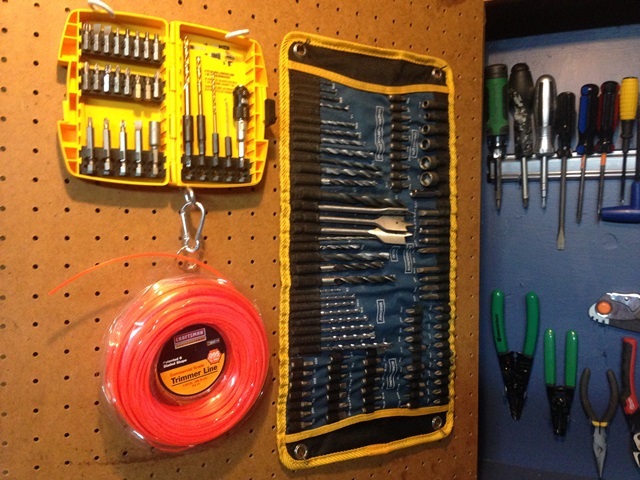 TIP #2- Take advantage of storage cases the tools come in. 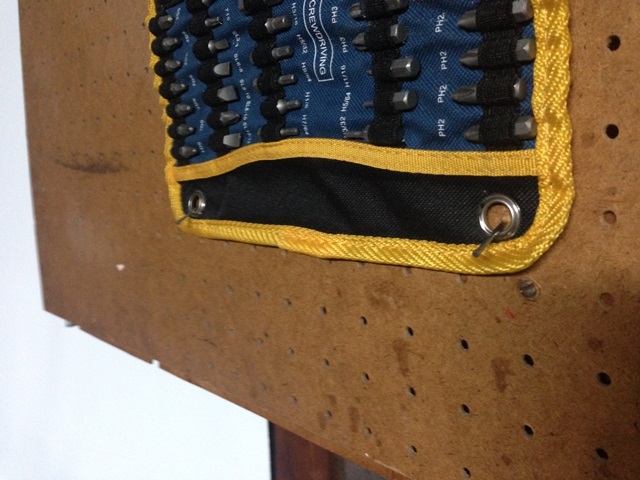 We just unrolled, hooked and even nailed the current storage cases to the pegboard doors. 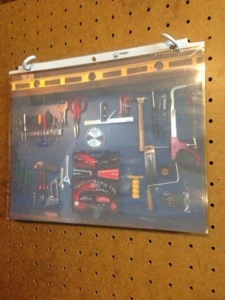 TIP #3- Random hooks sold as hanging bike or yard tool hooks are also fabulous for storing power tools. This entire pack at Target cost about $8 and look at all the great ways to use them. I even found a dowel and with the hooks it became instant paint/duct tape dispenser. 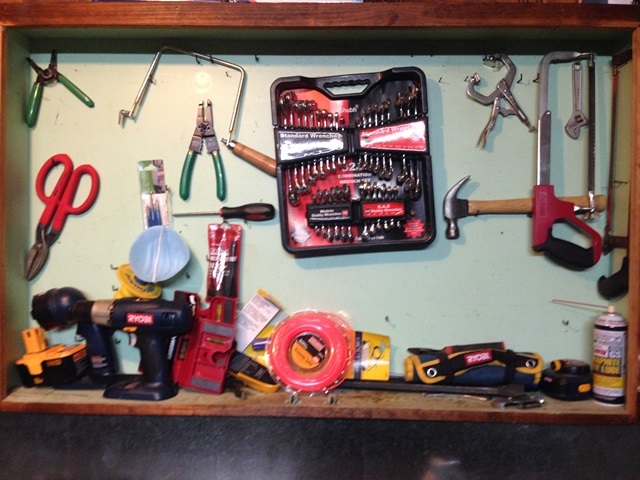 We hope these tips help you on your goals for an organized garage and tools. Happy Sunday everyone! 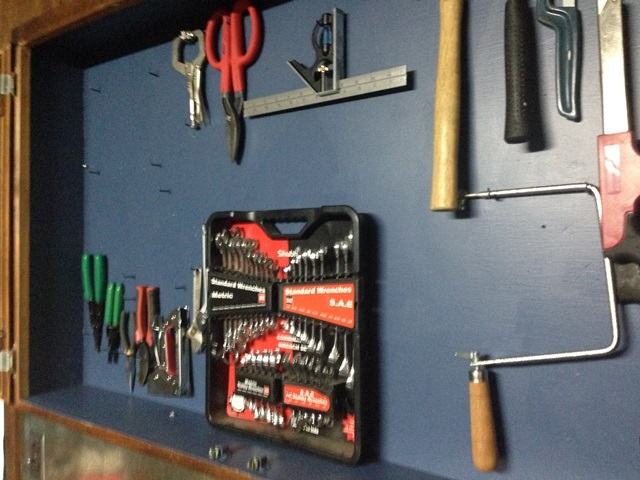 This entry was posted in Projects and tagged cabinet, cheap valentines day gift for husband, garage man cave, man cave in garage, organizing tools, pegboard, power tool cabinet, projects by Tandra. Bookmark the permalink.